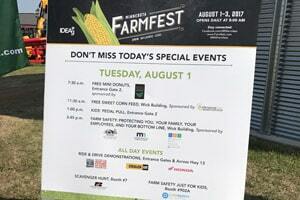 Minnesota Farmfest 2017 was held August 1-3, 2017 near Redwood Falls, MN. This was the third year UMASH participated in the show to network and provide educational resources on farm safety and health directly to the farm owners, families and workers. Diane Kampa and Carol Peterson represented UMASH along with colleagues from the Great Plains Center in Iowa and the Central States Center in Nebraska in an educational booth. UMASH and partners from the Minnesota Safety Council and the Minnesota Department of Agriculture sponsored a panel discussion titled: Farm Safety: Protecting You, Your Family, Your Employees, and Your Bottom Line. The purpose of the panel was to draw attention to a wide range of considerations related to worker health and safety. This was an opportunity to reach the larger Minnesota Farmfest audience with key information and resources from our partners and our centers.